The Boer War has now largely been forgotten, overshadowed by the Great War, which engulfed the entire world in a suicidal conflict only 12 years after the fighting between the Boers and the British Empire had ended. 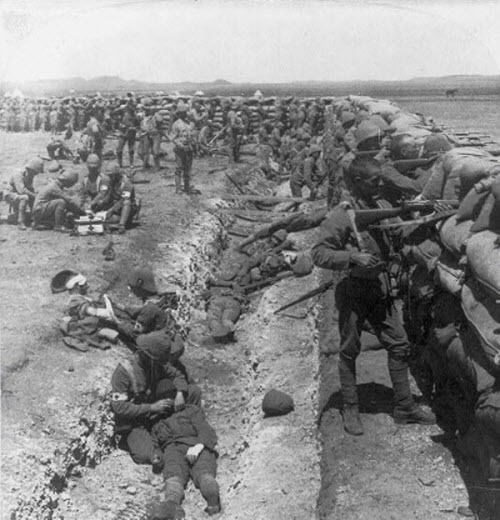 However the Boer War was by no means an insignificant conflict; lasting almost as long as World War 1, the Boer War was the first great war of the new century, and in many ways a rehearsal for all of the wars that followed. 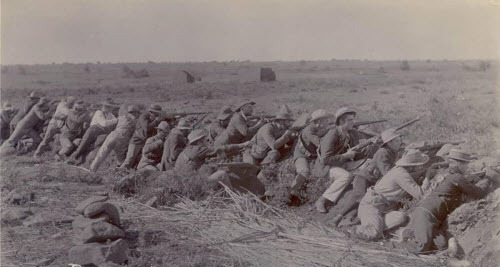 During this war, new weapons and tactics were introduced and tested; lessons were learned - and often not learned - and many of the British commanders of the Boer War would go on to lead troops in the First World War, often with the same disastrous results. The Boer war was also the end of any pretence of chivalry or honour in war, and presaged the total war of the twentieth century: the unarmed Boer civilian population was put into concentration camps by the British where thousands of women and children died of starvation and disease. In the countryside the British adopted a scorched earth policy, destroying Boer homes and cattle in an effort to starve all resistance into submission. And yet the so called Boer "Bitter Enders" tied down the British army and its allies for years, in one of the world's first examples of asymmetrical warfare. It is perhaps not a coincidence that the Boer War began at the very end of Queen Victoria's reign and the passing of the Victorian Era. The British Empire was at its absolute height, and the world's superpower. It could correctly be said, and with deserved pride, that the Sun never set on the British Empire, because there was no corner of the globe where the Union Jack did not fly. From remote islands in the South Atlantic, to its developed colonies of Australia and Canada, to India, its chaotic Jewel in the Crown, the British Empire ruled over more than a quarter of the globe and a majority of its inhabitants. Its power was challenged by the Czarist Empire of Russia, with whom it played the Great Game for hegemony over India and Central Asia. And Germany and the United States were rising, but for that one moment in time, Great Britain was the absolute master of the seas and its destiny. 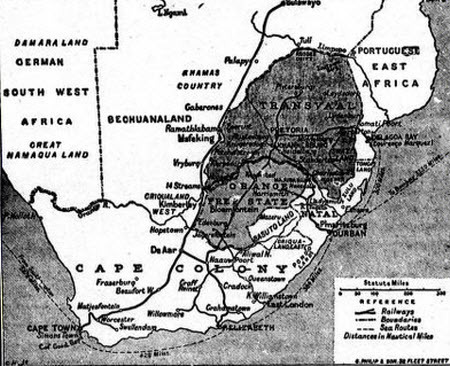 The colonial ambitions of the British Empire were challenged by the small Boer republics of the Orange Free State and the Transvaal republic, located in what is now the north east of the republic of South Africa. Like South Africa, these states were created by white colonists. But whereas South Africa was a British dominion, these two small Boer republics had long ago broken ties with their mother country, Holland. The Boers were now native to the place and regarded their little countries as their sacred birth right. They spoke a dialect of their own called Afrikaans and had their own unique way of life which was primarily agricultural though both republics had cities and some infrastructure. Most of all the Afrikaans were fiercely independent, fanatical in defending their rights, and no pushovers. When war came with the British Empire, the plucky Boers refused to surrender and despite being heavily outnumbered and overshadowed by the industrial might of the Empire, they conducted a spirited defence of their homeland which inflicted heavy losses and bitter humiliation on the proud imperial troops. It is a measure of their tenacious defence, that the Empire was forced to call upon troops and material from all corners of the Empire in order to defeat the Boers. Troops were drafted from the Indian subcontinent, recruited from Australia and Canada, and from the mother land itself. But even against these impossible odds, the Boers held out. First fighting a conventional war and then, when they were finally overwhelmed in the field by the superior arms and numbers of the British, resorting to a brilliant guerilla warfare that tied down thousands of imperial troops and exacted an enormous toll in causalities and material losses. The Boer defence of their homeland can in some ways be compared to Finland's surprisingly effective defence of its soil against Soviet invasion. In both cases, a small but extremely dedicated and effective fighting force was able to stall and humiliate a much superior invading force. The outcome of such as uneven conflict was perhaps never in doubt. The end was the annexation of the republics and the loss of their cherished independence. On a surface level the defeat of the Boer republics seemed to mark a glorious victory for th empire. It had emerged victorious, the bonds of loyalty with its colonies had held firm and the Dominions of Canada and Australia and New Zealand had fought alongside their British brothers. But though they did not realize it yet, this last colonial victory would mark the high water mark of the Empire. The annexation of the of the Boer republics would be the last territorial expansion of the British Empire. For despite its apparent victory, the British Empire had been shown to be weaker than it seemed. Its troops had performed poorly, its generals had led badly, and it had lost much of its moral authority through the mistreatment of Boer civilians who were rounded up and held in appalling concentration camps, in an effort to defeat the insurgency. This website is an archive of information about the Boer war, including a photo archive, first hand accounts of the war by soldiers and civilians, and a concise history of the war.